On 1 April, in good time for the school Easter holidays, the British Library will open an exhibition which should appeal to children and adults alike: Twinkle Twinkle, Little Bat (from Lewis Carroll's rhyme for the Mad Hatter's Tea Party). It celebrates 400 years of poems for children, with illustrations. 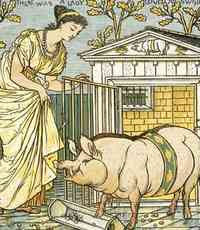 This charming picture is by neglected Liverpudlian artist Walter Crane, who illustrated a number of children's books. This one is The Baby's Opera: A Book of Old Rhymes in New Dresses. The exhibition continues until 28 June, admission free. Click the title link for details.